Intense public interest in the death of Osama bin Laden has created fertile ground for scammers looking to exploit the world's most wanted terrorist's death. 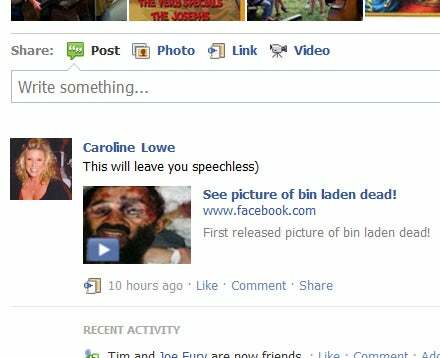 Bogus images and videos of bin Laden's corps serve as bait for malware peddlers on Facebook and in e-mail inboxes. Major security companies and the U.S. Federal Bureau of Investigation say gullible victims that click on links risk infection by Trojan software applications designed to infect your PC and monitor your online banking activity. Symantec, makers of Norton Anti-Virus, reports the first Bin Laden-related scam popped up just three hours after the news of the terrorist's death broke on Sunday. "In all likelihood, there will be an increase in spam volume targeting this news," Symantec said. The U.S. Federal Bureau of Investigation has issued a warning about an influx of email scams offering photos of Bin Laden's corpse. "Even if the sender is familiar, the public should exercise due diligence," the FBI said. Security watchers have spotted a Trojan designed to monitor your online banking activity, and Facebook scams are popping up offering videos of Bin Laden's final moments. Bin Laden scams are so popular even the old Nigerian bank scammers are shaking the dust off their decades old con job to get in on the action. Here's a look at some of the top online Bin Laden-related scams happening online. Email scammers are trying to trick you into downloading a compressed file of purported photos showing Bin Laden's body after being shot by American forces, according to security firm F-Secure. Once you download the compressed "images," you are asked to run an executable file before you can see them. But instead of gruesome photos on your desktop you end up with a Banload Trojan that monitors your online banking sessions and attempts to redirect your online payments into the wrong accounts. The classic Nigerian banking scam, a so-called 419 scam, is using Bin Laden's death in their scam. Symantec uncovered scam messages that say something like "Osama Is Dead" as part of the subject line and then tries to get you to buy into the classic rip-off. A 419 scam attempts to bilk you out of your own money while stringing you along in the hopes of a larger pay off later. This scam can go on for years and involves a mix of online and offline cons. Symantec said the scam is likely to get in front of more eyeballs than usual since people are probably more willing to click on Osama-related email right now in hopes of finding out more news about the event. Another email scam sends a piece of text that looks like a news item with a link to more information. But instead of seeing more news you end up on a promotional site for products such as window replacements, according to Symantec. The best way to stay safe from purported Bin Laden-related video and photo scams is to keep yourself informed of the issue on respected mainstream news sites such as The New York Times or CNN. Here's a link to the most recent story (at the time of this writing) surrounding the debate about releasing photos of Bin Laden's corpse. Chances are if you see a link to Bin Laden-related video or photo on Twitter, Facebook or your inbox that it is not the real thing. As always, make sure you are running an up-to-date anti-virus program to monitor your system for any problems. PCWorld offers a selection of free anti-virus programs in the downloads section of this site.